While we do our best to ensure the system generated emails have as much applicable information as possible, you may need to edit the email templates to suit your specific needs. Perhaps you'd like to change the layout of the emails, or maybe you'd just like to add/remove certain elemental portions of it. Fortunately, as with many aspects of 3dcart's look and feel, you have access to edit the email templates as needed. To access and edit your store's various email templates, go to Settings ->Design ->Emails and click on the "Actions ->Edit" button for the specific template you'd like to edit. Beginning with version 6.6.0 of the 3dcart software, all email templates have been made responsive. However, if you have previously edited your email templates prior to 6.6.0, then those templates have not been updated (to preserve your changes). If there are email templates in your store that have a newer, updated version available, they will be marked with an asterisk (*) indicating this. You may upgrade the templates as desired using the upgrade functions on the edit page for each template. Below is a reference of the available templates and their basic function. 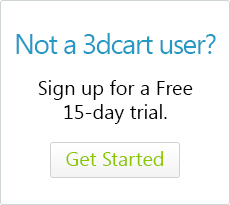 If you have added or enabled certain 3dcart add-ons or modules like 3dReminders and select others, you may also see templates for these functions on this list. Email sent to Affiliates when their account is made active. Email sent to Merchant when an affiliate's account is made active. Email sent to Merchant when an affiliate's order is approved. The CRM - New Ticket email will contain the basic CRM ticket information. However to reply to and process the ticket, you will still need to log into your account's CRM function from within your Online Store Manager. Email sent to customer's recipients, notifying them of their Gift Registry. Email sent to the Gift Registry customer notifying them when someone has purchased something from their gift registry. Email sent to customer when their order is created on the store. Email sent to the merchant when a new order is received. Email sent to the customer, when their order status is set to "Processing"
Email sent to the customer, when their order status is set to "Partially Shipped"
Email sent to the customer, when their order status is set to "Shipped"
Email sent to the customer, when their order status is set to "Cancelled"
Email sent to the customer, when their order status is set to "Hold"
Email sent to the customer, when their order status is set to "Not Completed"
Email sent to the customer, when their order status is set to "Unpaid"
Email sent to merchant when a "Group Deal" has ended. Email sent to merchant when a "Group Deal" has reached a certain percentage. Email sent to customer when their "Make an Offer" offer is approved. Email sent to customer when their "Make an Offer" offer is declined. Email sent to the Merchant when a new "Make an Offer" offer is received. Email sent to a customer when their product review is approved. Email sent to the Merchant when the "Stock Alert" level has reached its threshold for a product. Email sent to merchant when a shopper signs up to be on the waiting list. Before making any changes to the templates, we highly recommend that you copy and paste the existing template information into a text editor such as notepad and save the information to your desktop. This way you can revert to the original template if your edits have any undesirable effects. In this example, we're editing the template for the order confirmation email that is sent to your shopper when they place a successful order. Text - The email content will be straight text with no formatting. Text/HTML - This setting will allow you to specify both text and HTML versions of the email. If HTML is not available to the recipient's email client, text formatting will be favored. This field will display as the email's "From" address. If left blank, the email will appear as coming "from" the Merchant email specified in your store's Merchant Information panel (Settings ->General ->Merchant Information). If filled in, this field MUST contain a properly formatted email address ([email protected]yourdomain.com) or the message will not send out. This field will blind carbon copy the message to any email address you specify. This can be useful if you'd like for the email to automatically forward to a third recipient within your organization. For example, you may want a copy of order emails going to [email protected] Since this field is a blind carbon copy, recipients will not see this email address at all. Along the right hand side of the screen, you will have options for comparing and updating template version updates mentioned at the start of this article.